I am so blessed to have made, during my adulthood, several close friendships with some amazing women. One of my groups of friends is connected through teaching at the same high school. We call ourselves "WTL," or "Work to Live," as a reminder that there is life beyond the school day. Because really, we do need reminding of that fact sometimes. In the last year, one of our WTLs, Erica, made The Great Escape. 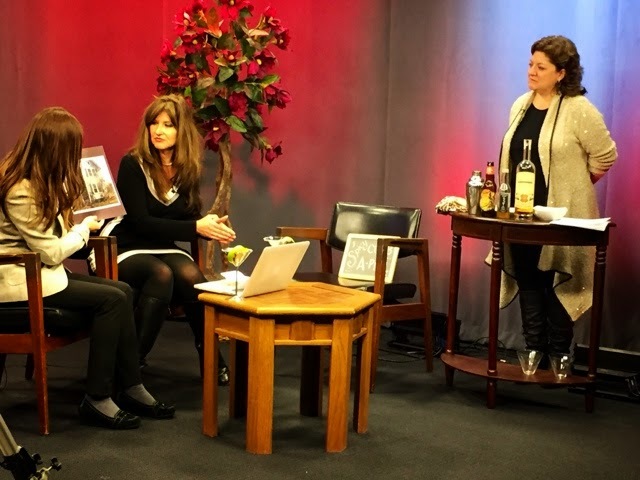 She left teaching for a new career in real estate, and within months, she and a new realtor friend, Reba, had their own show on West Hartford's community cable station, WHCTV. The show, called Real Estate Resource, is part The Kitchen, part Watch What Happens Live, but with a focus on real estate. That is to say, it's a talk show with flair. Never one to hoard her own successes, Erica gave the rest of us WTLs a way to be a part of the show. I am the show's mixologist. 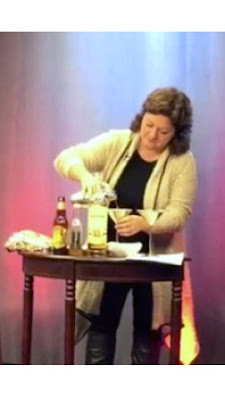 I create cocktails based on the theme of each episode and demonstrate how to make them during my segment. Joanne is the flower expert who shows viewers how to decorate their homes with wreaths and floral arrangements. Laura does our hair and makeup and there are plans for her to show off her other artistic skills in future episodes. So far, we've only taped one. At this point, you're probably wondering why I'm writing about all of this on a food blog. Well, here it is. 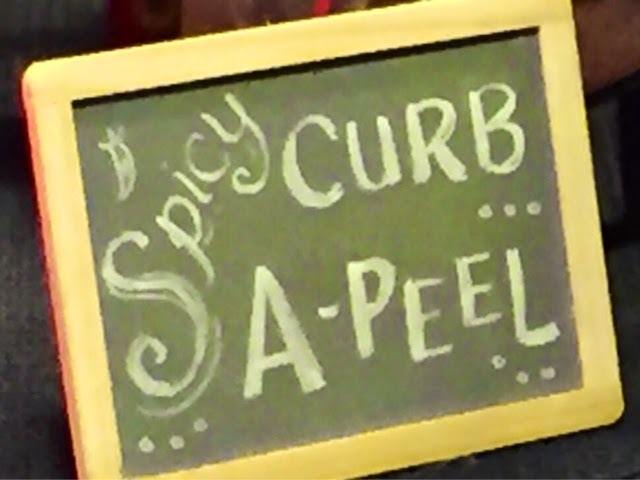 The theme of our first episode is "Spicing Up Your Curb Appeal in Winter." 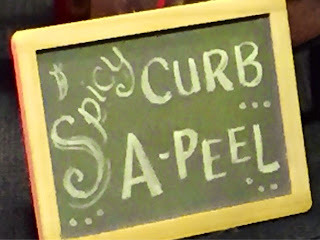 And so I came up with a drink I call the "Spicy Curb A-peel." With hints of honey, apple, ginger and cinnamon, it's the perfect cocktail for entertaining guests and making them feel warm and cozy in your home during the winter months. 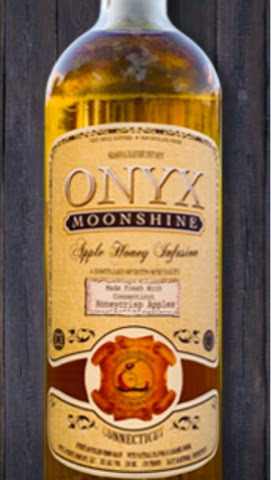 As an added bonus, it is made from local and/or artisanal products, including Onyx Moonshine from East Hartford, CT and Yellow Ginger Simple Syrup from Sumptuous Syrups of Vermont. 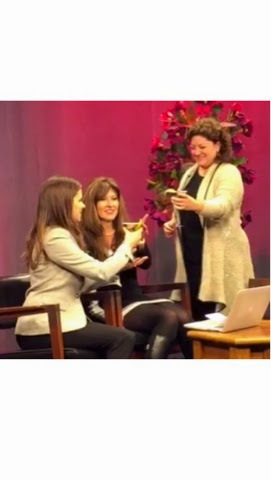 And while I'll give you the recipe (below), I sure hope you'll check out Real Estate Resource, which is airing on WHCTV every Thursday in January at 8:00. If you don't live in West Hartford, you can stream it when it airs online at this website, or you can watch it ON DEMAND HERE. Fill a cocktail shaker with ice. 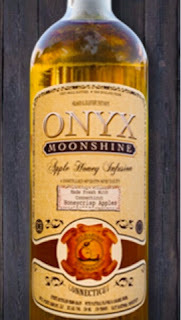 Add moonshine, syrup and hard cider. Stir (don't shake because the hard cider is carbonated). Pour a little of the leftover cider into a small bowl or dish, and the sugar and cinnamon (stirred to combine) into another. 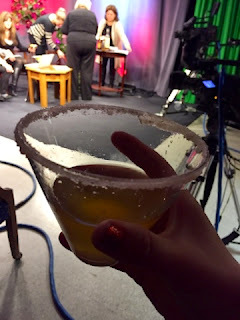 Dip the rim of a martini glass first in the cider, then in the cinnamon sugar to coat the rim and allow the cinnamon sugar to stick. Repeat with second glass. Strain cocktail into glasses and garnish as desired.